With the D5600 camera, Nikon proves once again that you don’t have to give an arm and a leg — or strain your back and neck — to enjoy advanced dSLR photography. Although the Nikon D5600 price is reasonable, the D5600 doesn’t skimp on power or performance, offering a great set of features to help you take your photography to the next level. But for novices, the camera also offers plenty of easy-to-use, automated modes. To help you get started using your camera, here’s a handy reference to your camera’s buttons, dials, and exposure modes. 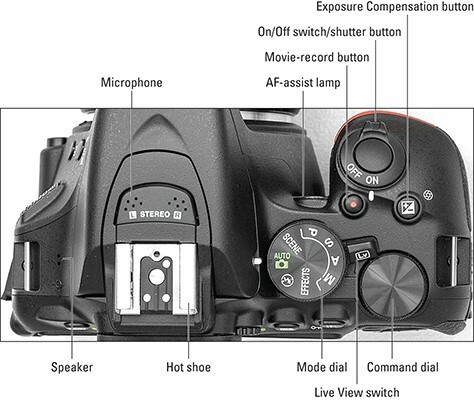 If you’re not familiar with the Nikon D5600 camera, here’s a quick guide to its buttons, dials, and other external controls. The lens shown here is the 18–55mm AF-P kit lens; other lenses may have different features. It’s great to have a map to the buttons and controls on your camera, but it’s not a lot of help if you can’t remember which button to press when (and why). So, here’s a look at the functions of the most important controls. (Some controls have additional functions during certain operations, but the table lists the ones you’ll use most often.) 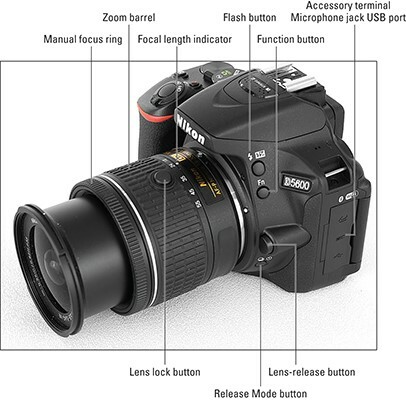 Note: This information concentrates on features available when you shoot in the P, S, A, and M exposure modes. A few controls also work in other modes. Mode dial Sets the exposure mode, which determines how much control you have over picture settings. For the most control, choose P, S, A, or M.
LV switch Rotate the switch to toggle Live View on and off. The viewfinder is unavailable when Live View is enabled. Movie-record button After putting the camera into Live View mode, press to start and stop recording. Menu button Opens the camera menus. Menu items that appear dimmed can’t be adjusted in the current exposure mode. Exposure Compensation button In P, S, and A modes, press while rotating the Command dial to apply Exposure Compensation (adjusts brightness of the next picture you take). A higher value produces a brighter picture. In Manual exposure mode, press while rotating the Command dial to adjust the aperture setting. Info button During viewfinder shooting, turn the Information screen on and off. When Live View is engaged, change the type and amount of data displayed on the monitor. 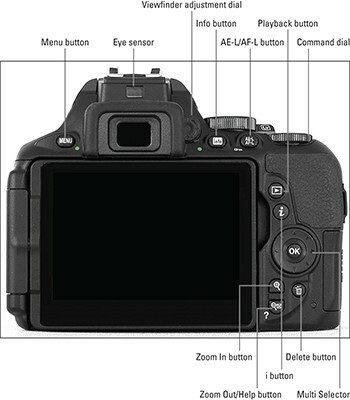 AE-L/AF-L button During shooting, locks exposure and autofocus; during playback, locks picture file. Locked files can’t be erased when you use the camera’s Delete functions; they’re erased if you format the memory card. 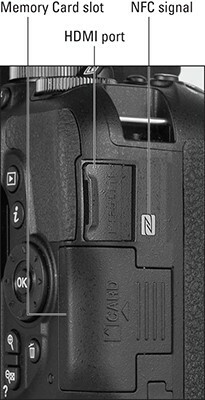 i button During shooting, displays the control strip, which provides quick access to various settings. During playback, displays i-button menu with access to post-capture features such as rating and retouching photos. Multi-Selector/OK button During shooting, press the outer edges up/down/left/right to navigate menus and select camera settings; press OK to lock in your choice of settings. During playback, press up/down to change the playback display mode; press left/right to scroll through pictures. Zoom In button During Live View shooting and picture playback, press to magnify the display. During movie playback, press to increase audio volume. Zoom Out Button Press to reduce on-screen magnification. During playback, press to cycle from full-frame playback to Thumbnails view and then to Calendar view. On any screen that has a question mark in the lower-left corner, press to display an information screen about the current function. Flash button In P, S, A, and M exposure modes, press to use the built-in flash. For exposure modes that offer flash, press while rotating the Command dial to change the Flash mode. Hold down the Flash button and Exp. Comp. button while rotating the Command dial to adjust flash power. FN (Function) button By default, offers quick access to the ISO setting. It can be programmed to perform other functions through the Custom Setting menu. Your choice of exposure mode determines how much control you have over picture settings, including options that affect exposure, color, and autofocusing features. 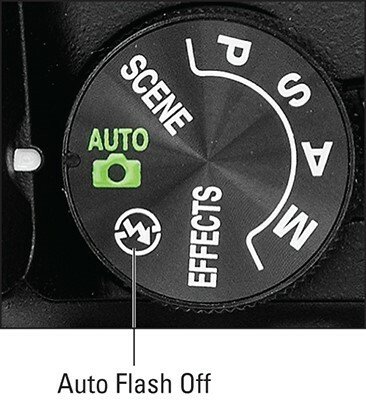 Set the exposure mode via the Mode dial, shown here. For the most control, switch to P, S, A, or M mode. Scene Offers options for capturing specific types of scenes: portraits, landscapes, sports photos, and so on. Rotate the Command dial to scroll through the available scene types. P (Programmed Autoexposure) The camera selects both the f-stop and shutter speed to ensure proper exposure, but you can choose from multiple combinations of the two settings. S (Shutter-priority Autoexposure) You set the shutter speed, and the camera selects the f-stop that will produce a good exposure. A (Aperture-priority Autoexposure) You select the f-stop, and the camera selects the shutter speed that will produce a good exposure.